Toy Poodles are clever and lively household companions, adaptable to their environments and are fairly easy to train—it’s no surprise that they were once very popular circus dogs. Overall, they are eager to please and a lot of fun to be around. However, keep in mind that the smaller the poodle, the more likely they are to develop a twitchy and nervous temper. Poodles are generally active and agile. They are happiest with daily walks and lots of outdoor play. Without enough attention and activity, they can get bored, agitated, restless and (sometimes) destructive. These are distinguished, elegant dogs with a stellar range of skills, including agility and obedience. Poodles do not like to be left alone for hours on end. They love being around people and are able to form bonds with each member of the family, as opposed to bonding with just one person. Poodles are ideal family dogs, being both patient and playful with children—Toy Poodles be slightly less patient with young children. They also make superb watchdogs, barking zealously when strangers approach the home. Poodles may look dainty and demur, but in truth, these are high-stamina dogs with a stellar range of skills, including agility, obedience, hunting and herding. 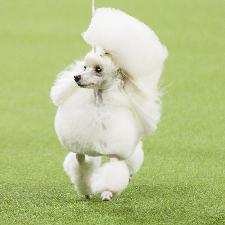 Your pretty Poodle could be a sporty competitor in addition to a beautiful show dog. As a Toy Poodle owner, you must be ready to groom: They need to be clipped and bathed regularly. On the plus side, they don’t shed. Toy Poodles can live as long as 15 years. Common issues can include hip dysplasia, allergies, skin conditions, ear infections and cataracts. Though Poodles have lived in Europe for centuries, no one knows for sure where they originated. Some claim Germany, but the consensus seems to be France, where they are considered a beloved national breed. Descended from the now-obsolete French Water Dog, the Poodle (most likely named from the German word Pudel, or “plays in water”) was used to retrieve waterfowl for hunters. Poodles were prized for their intelligence and good manners, eventually being used in circuses and dog shows and, of course, as companions. The Standard Poodle is believed to be the oldest of the three Poodle versions. Miniature Poodles and Toy Poodles were most likely bred from the larger Standard Poodles, but all three are judged in the same categories.